Whether you’re unhappy with your existing door’s appearance, it is damaged beyond repair or it is nearing its life expectancy (from 15 to 30 years), deciding to purchase a new garage door provides an excellent opportunity to increase curb appeal. A new garage door can also increase property values making it a popular home improvement project. Measure the width and height (1 and 2) of your door opening in feet and inches to determine what size garage door you’ll need. If you have multiple doors, measure each individually. You can also hire a garage door repair professional to take measurements. 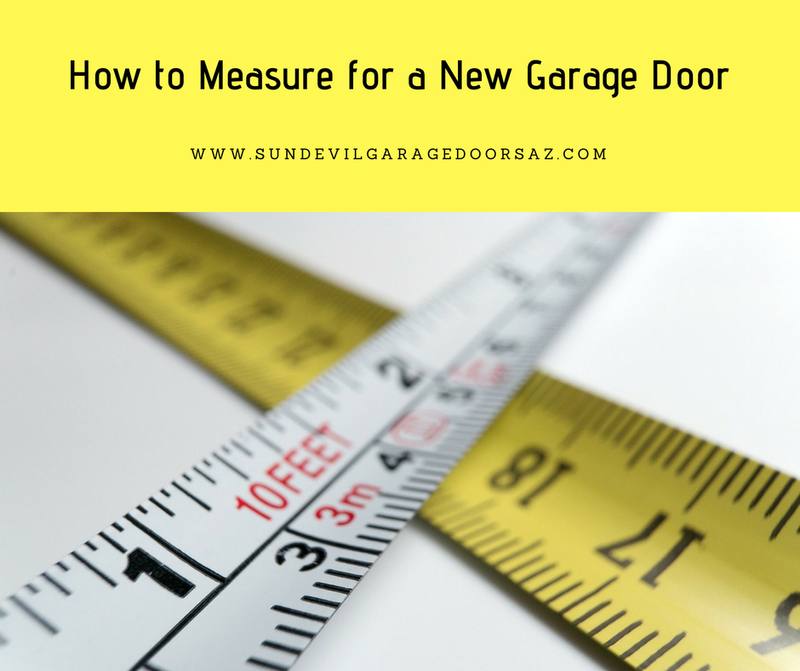 The next step is to measure the side room on both sides of your garage door opening (3 and 4). This measurement is necessary to ensure proper installation of the vertical tracks. Ensure 3.5 to 4 inches on each side. 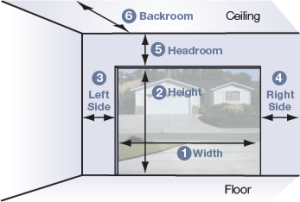 Measure the headroom (5) – the space between the top of the door opening and the ceiling. The distance needed will vary, depending on whether the door requires torsion or extension springs, which work to balance the heavy door as it opens and closes. Finally, you will want to measure the backroom (6), which is the distance between the garage door opening toward the back wall. Door height plus an additional 18-inches is required to ensure proper fit for both the door and opener. Now that you’ve measured and selected your new garage door, it, along with all its components and an automatic garage door opener can be installed. This is a complex process that requires specialized tools. Garage door service professionals have the experience and equipment to install your new system safely and efficiently. The International Door Association (IDA) recommends completing the following maintenance tasks monthly to ensure the door functions safely and securely. Maintaining the door can also help to extend longevity. Visual Inspection: Note any unusual noise or movement as the door opens and closes. Inspect the tracks for debris; wiping them out as needed with a damp cloth. Then inspect the door components for any signs of damage or corrosion. Door Balance Test: With the door firmly closed, disconnect the opener following manufacturer instructions, and then manually lift the door to waist height. The door should move easily with one hand. It should also remain open. Photoelectric Eye Test: Start with the door open. Activate the door to close, then as it is descending, pass a broom in front of one of the sensors. The door should open. A repair professional should be contacted if the door fails ANY tests. Lubricate the Door: Every six months, lubricate the door’s moving parts using a product specifically designed for garage doors. You should also check the door’s weatherstripping for wear or tear, replacing as needed. Clean the Garage Door: Cleaning the garage door is an easy chore that with the right products will take only minutes. Always start at the top and work your way down. To prevent damage, use soft sponges and avoid using a pressure washer.